Indian novelist Kiran Desai succeeded on 10 Oct., 06 where her mother failed and won the Booker Prize, the youngest woman ever to capture one of the world’s most prestigious literary awards. Desai, whose mother Anita was three times short listed for the Booker, won the £ 50,000 prize at her first attempt for her sweeping novel, The Inheritance of Loss. The extraordinary achievement makes the 35 years old Kiran Desai the youngest woman ever to win the Booker, a distinction previously enjoyed by Arundhati Roy. In a remarkable act of literary filial devotion, Desai began the task of turning her mother into almost a joint Booker winner even as she accepted the award. 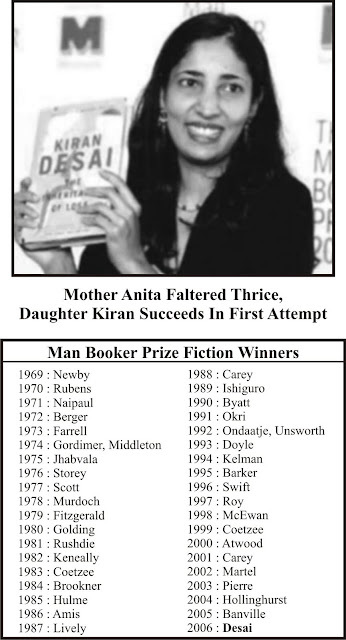 She’s now being compared to her other Booker – winning predecessors from India such as Arundhati Roy (The God of Small Things) ans Salman Rushdie (Midnight’s Children). Desai’s book, The Inheritance of Loss, is a story replete with sadness over globalization and with pleasure at the surviving intimacies of Indian village life. Kiran Desai was born in India in 1971, she lived in Delhi until she was 14, then spent a year in England, before her family moved to the USA. She completed her schooling in Massachusetts before attending Bennington College; Hollins University and Columbia University, where she studied creative writing, taking two years off to write Hullabaloo in the Guava Orchard. 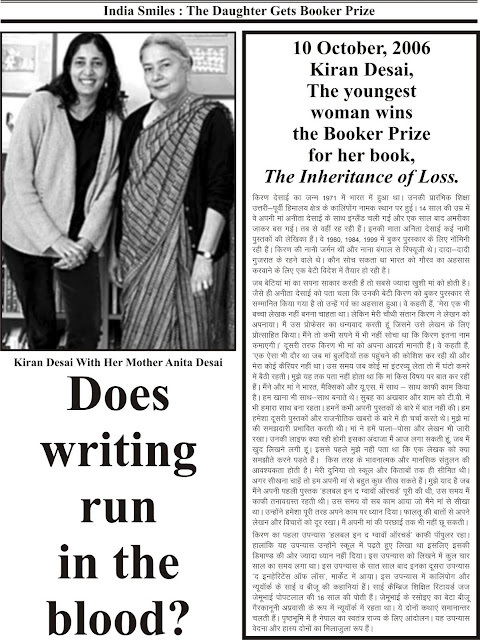 Her mother Anita Desai currently teaches creative writing at MIT. Her maternal grandmother was German, but left before the World War II and never returned. Her grandfather was a refugee from Bangledesh. Her paternal grandparents came from Gujarat, and her grandfather was educated in England. Although Kiran has not lived in India since she was 14, she returns to the family home in Delhi every year.